As part of the SICK AppSpace eco-system, the Sensor Integration Gateway (SIG) product family allows the seamless integration of sensor data and enables customizable application solutions based on the SOPAS ET technology. 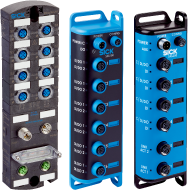 Digital input and output signals or IO-Link signals can be bundled easily via the ports on the SIG100 Sensor Integration Gateway and then linked to form a customized sensor-actuator system using the drag & drop function in the logic editor. The collected data can therefore be merged and transmitted to higher-level systems, including in the context of Industry 4.0.